This summer is flying by. My son only has a few more days of summer vacation, and he has been spending as much time as I will allow playing video games. We’re already ready for school, supplies have been bought and we’ll meet his new teacher next week. So to enjoy this last bit of time I get with my son before the new school year starts, we’ve been doing little fun things around the house, like making ice cream. 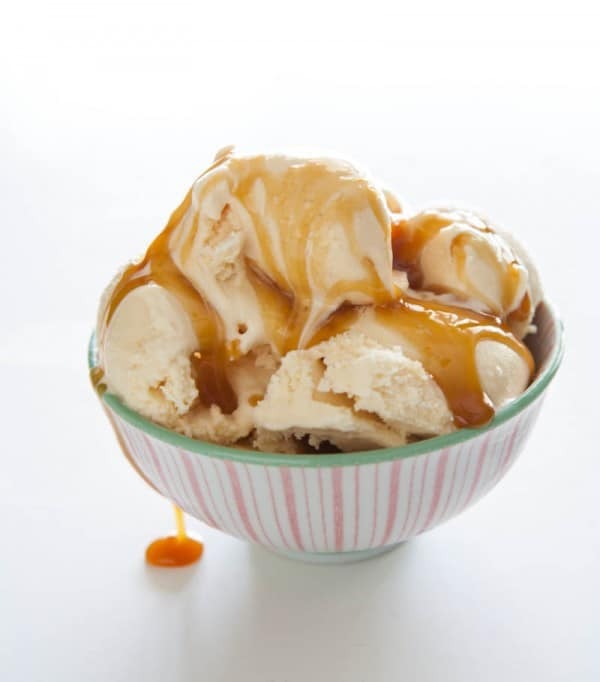 This simple three-ingredient, no cook ice cream was the perfect recipe to make with him. It only takes a few minutes to makes and the results are incredible. For this recipe, I simply used a can of condensed milk, a pint of half and half and some homemade vanilla extract. After I mixed it well, I poured it in my KitchenAid ice cream maker, and let it churn. In just 15 minutes, I had beautiful soft serve ice cream. We let the ice cream set up in the deep freeze before eating it though. 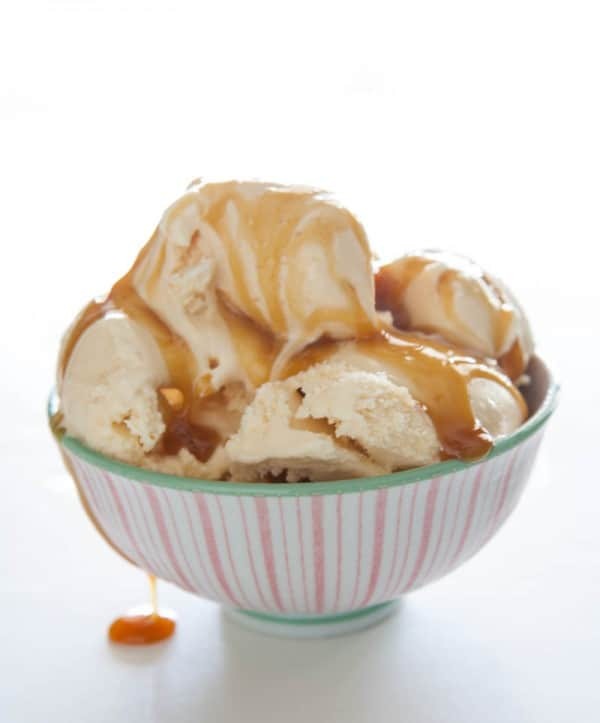 We topped it with some caramel, my son’s favorite. It made the perfect easy homemade summer dessert. Speaking of milk and cream, I’ve recently partnered with The REAL Seal to bring you some great recipes, like this Super easy Ice Cream made with REAL dairy products. Did you know that The REAL® Seal is the only assurance that what you are buying is made with the wholesome goodness of U.S.-produced cow’s milk? When you buy only products with the REAL® Seal, you can trust that you are buying only products or foods made from cows milk produced in the U.S. Milk and dairy foods are a core part of a healthy diet recommended by the 2010 Dietary Guidelines for Americans (DGA). The DGA recommends 3 servings of low-fat or fat-free milk or milk products for those 9 years or older, 2.5 servings for those 4-8 years old, and 2 servings for those 2-3 years old. Americans are currently consuming about 2 dairy servings per day on average (1.8). Combine all ingredients a large bowl. Mix well to combine. Pour mixture into ice cream machine and churn for 10 - 15 minutes, or until soft set. 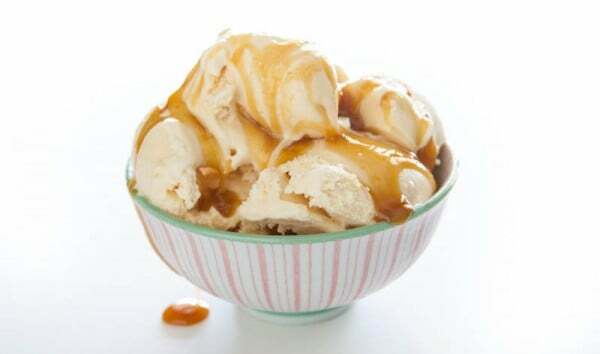 Pour ice cream into a freezer safe container and freeze for 6 - 8 hours or until set. Use heavy cream instead of half and half and whip until you have soft peaks. Fold in refrigerated condensed milk until well-combined. Freeze until set. Appreciate it! That had been great and thus easy for cooking. If I did not use an Ice Cream machine and I used an electric hand mixer. On what speed and how long do you think I would need to mix before it formed soft peaks?